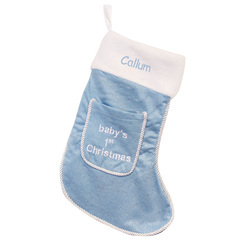 Personalise this Blue My 1st Christmas Stocking with any name up to 12 characters. Features a small pocket on the front of the stocking which has embroidered on 'Baby's 1st Christmas' as standard text. The stocking is edged with a silver rope effect seam and features a hoop of ribbon on the top left to enable the stocking to be hung.